Robert F. Kennedy Jr.: Advocate for anti-science and anti-vaccination. The Kennedy family name is laden with history and brings to mind a definite set of characteristics: glamor, power, intelligence, wealth, influence. Kennedys have had their name on a president, numerous senators, representatives, ambassadors, and other high office holders. The Kennedy dynasty, if you wish to call it that, has seen its share of triumphs and disasters, of course. I need not go into detail; scores of books have been written about them, from putting humans on the Moon and the championing of civil rights to personal tragedies of assassination, death, scandal, and more. Most of these issues are in the past. But there is an ongoing problem associated with a Kennedy, one I consider extremely troubling. 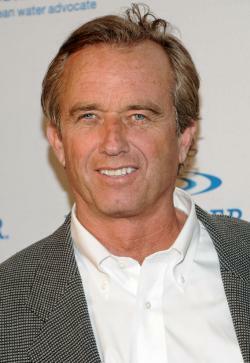 Specifically it’s with Robert F. Kennedy Jr., who is an attorney, a radio host, and an environmental activist. He is also, as it happens, a full-blown anti-vaccination conspiracy theorist. And I do mean full-blown. RFK Jr. has a long history of adhering to crackpot ideas about vaccines, mostly in the form of the now thoroughly disproven link to autism. He’s been hammering this issue for a decade now, and his claims appear to be no better and no more accurate now than they were when he first started making them. To be clear, I am a parent myself, and when my daughter was an infant, my wife and I fretted over this issue. Concerned about her development and health, we did the research and found that the overwhelming benefits of vaccination far outweighed the very slight actual risks. That is why our daughter is fully vaccinated, as are both my wife and I. We keep our booster and flu shots up to date as well. So the anti-vax claims of Kennedy are very concerning to me. I’ve written about him before, but he came to my attention again when Keith Kloor at Discover magazine noted Kennedy was the keynote speaker at the 2013 AutismOne/Generation Rescue Conference. Both AutismOne and Generation Rescue claim to be about advocating for people touched by autism—and there is no doubt their concern is genuine—but when you scratch the surface you find they also advocate dangerous nonsense about medicine and treatment. To give you an idea of what these organizations are about, Generation Rescue is fronted by notorious anti-vaxxer Jenny McCarthy, about whom I’ve written many times (here is a post with plenty of links about her)—but if you want a great overview of why McCarthy is so bad, read this open letter to Oprah Winfrey about her in 2009. Nothing has changed since that was written. Generation Rescue has a well-known advocacy for anti-science, commonly misinterprets real science, and has a history of nasty attacks on those who point out their logical fallacies. 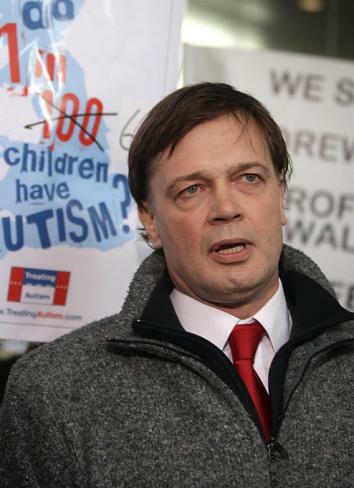 The now thoroughly discredited Andrew Wakefield in 2010, shortly after the ruling that he had acted “dishonestly and irresponsibly” in carrying out his research. AutismOne, for its part, is just as bad. In 2010 the group issued a letter in support of Andrew Wakefield calling him a “hero” and invited him to speak at this year’s conference. This is the same man who is largely responsible for the modern anti-vax movement due to his unethical and fraudulent research that led to a paper linking vaccines and autism in 1998. That paper was later withdrawn by the Lancet, and many of the co-authors disavowed it. His misdeeds are being widely blamed for the current measles epidemic in Wales and other countries. Together, these two groups put on the conference, which is a veritable what’s what of nonsensical and, in many cases, unproven autism “therapies,” from homeopathy to bleach enemas. And yes, you read that correctly. Which brings us back to RFK Jr. I wasn’t at all surprised he’d be a speaker, even the keynote, for a joint convention between these two groups. In many ways, the modern anti-vax movement owes as much to him as to Wakefield. In 2005, he published a remarkable essay in Salon and Rolling Stone called “Deadly Immunity,” linking the preservative thimerosal to autism. The article was overwhelmingly ridden with factual errors, so much so that Salon later took the extreme measure of removing the article from its archives. But the damage was done. Kennedy had helped mainstream the fear of vaccines. In the ensuing years he has hardly eased up. Kennedy has a radio show called Ring of Fire where he advocates for various issues and causes. In 2011 he had Boyd Haley, a retired chemist and promoter of various “alternative” treatments, on as a guest. This is a man the medical skeptic Orac calls a “crank” and who has had several run-ins with the Food and Drug Administration because of his claims for some of the products he sells, which have not been shown to be effective and safe. Since 2001, no new vaccine licensed by FDA for use in children has contained thimerosal as a preservative, and all vaccines routinely recommended by CDC for children younger than 6 years of age have been thimerosal-free, or contain only trace amounts of thimerosal, except for multi-dose formulations of influenza vaccine. The most recent and rigorous scientific research does not support the argument that thimerosal-containing vaccines are harmful. However, CDC and FDA continually evaluate new scientific information about the safety of vaccines. If thimerosal were the cause of autism, we should see a drop in autism rates once the use of the preservative was stopped. Those rates did not drop; in fact, they’ve increased over time (likely due to better diagnoses rather than an actual increase in prevalence). That was a case-closed moment for the idea that thimerosal caused autism. However, RFK Jr. and Haley, as true conspiracy theorists do, simply dismiss that inconvenient truth. They claim that the studies were flawed, even fraudulent, that ethylmercury (used in thimerosal) is dangerous, that “massive fraud” is going on, that the Amish don’t get autism (an old canard that is simply untrue); they claim anything and everything except that thimerosal has never been shown to have an association with autism. Incidentally, going full-tilt-conspiracy at the very end of that interview, Kennedy calls the scientists and doctors at the CDC “criminals” because “they are poisoning kids.” Wow. These people he defames have devoted their lives to researching, understanding, and mitigating the effects of diseases that sicken and kill millions of people around the world, and Kennedy dismisses them out of hand, accusing them of harming children. [Kennedy has] been involved in the fight to hold government health agencies responsible for the vaccine-induced autism epidemic. Kennedy’s article Deadly Immunity chronicled the cover up by the CDC and FDA blasting the agencies for putting politics before science. He comes to the conference with a new book that further exposes the dangers of thimerosal and ongoing corruption of the CDC. So it’s clear his stance has not changed from firm denial of reality, fitting in with the conference’s aims at large. Unfortunately, I have seen neither a transcript nor video of his speech. I hope one becomes available; I’m obviously quite curious about precisely what he had to say. I’ll note former Rep. Dan Burton (R-Ind.) spoke at this conference as well. He has long advocated anti-vax quackery, even participating in shameful hearings in Congress about it. It goes to show you that some anti-science knows no partisan bounds; it’s hard to imagine many other issues the conservative congressman and Kennedy would agree on. That’s an important point. A lot of anti-science tends to be a wholly owned subsidiary of the Republican Party: climate-change denial, evolution denial, stem-cell research, anything going against the more fundamental tenets of religion. Some of these are actually incorporated into the party’s planks. The Democrats are more diverse (and haven’t embraced their own flavors of anti-science in the party planks), but progressives do cleave to some anti-science, most broadly things like being against GMO foods and supporting “alternative” medicine. This is peculiar to me; I’d think a priori most progressives would be more likely to embrace science, but in these specific cases, at least, they’ve abandoned it. I find that disappointing. I think of myself as a progressive in many ways, though I take things on a case-by-case basis. By definition a progressive wants to move forward, to look to the future, rather than look back to a semi-mythical “good ol’ days.” That progress must include embracing science, the evidence behind it, and the methodology that leads to amore accurate understanding. Progressives may be more inclined to listen and believe what Kennedy has to say simply because of his name. But they also need to know that facts, evidence, huge numbers of studies, and reality itself are at odds with his claims. Like Wakefield, McCarthy, Generation Rescue, and AutismOne, Kennedy is saying things that are not only utterly wrong but also dangerous. With outbreaks of preventable diseases around the world and people, including babies, dying from them, the claims of the anti-vaxxers constitute a public health threat. The more people who understand that, the less likely we’ll be to see epidemics from diseases that have no business infecting people in the 21st century. My opinion: Don’t listen to crankery, whether it’s from Kennedy or an autism advocacy group. Instead, talk to your board-certified doctor. If he or she recommends getting your vaccinations, do it.